Pictured above are the state qualifiers and their coaches, left to right: Head Coach Bruce Schmiedt, Riley Stevens of Wessington Springs, Bailey Schmiedt of Woonsocket, and Assistant Coach Dominic Schmiedt. Senior Blackhawk wrestler Bailey Schmiedt and junior Riley Stevens participated in the South Dakota State Wrestling Tournament that took place in Sioux Falls on Friday and Saturday, Feb. 23 and 24. Neither wrestler made it to the second day of competition, but they both have a lot to be proud of as part of the best wrestlers in the state. This year’s state tournament proved that wrestling in South Dakota is stronger and better than it has been in years and is just going to continue to build from here. …Read on and see more pictures of the competition in this week’s issue of the Sanborn Weekly Journal. 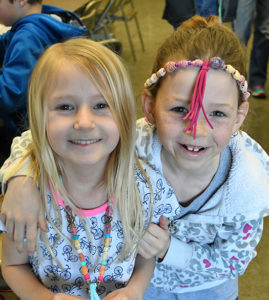 Whitney Adams and Landree Zoss are super excited to show off their new necklaces they made at the Cultural Paper Bead Workshop. Friday, Feb. 16, was a busy day of 4-H! Audra Scheel, SDSU Extension 4-H Youth Program Advisor, led a training for swine exhibitors titled “Youth for the Quality Care of Animals.” This is the first year for the program, which is replacing the old training “Pork Quality Assurance.” Seven Sanborn County 4-H members attended the training. Starting in 2019, all youth who are exhibiting meat-producing animals will take the training on an annual basis. YQCA certification is designed to help prepare youth as young producers in animal agriculture industry. That’s why the program includes information on multiple species even though the member may only be raising one or two. The hope is that, by raising animals, the 4-Her sees they are part of a larger community that relies on the good faith of everyone doing their part. The training focuses on food safety, animal well-being and being a person of good character. Nineteen youth attended the Cultural Paper Bead Workshop later that morning. Youth learned how to make paper beads and then were able to string them into their own jewelry. The art of paper beads goes back, in England at least, as far as the Victorian age. The women of the house would gather to make beads from scraps of wallpaper that were rolled on knitting needles. They would then polish the beads with bees wax and string them on to long pieces of yarn. Attendees learned how the women and children of Haiti make beads and use the income to support themselves and their families. This project can be shown in the Cultural Education or Visual Art 4-H project areas. Youth were also able to take part in Consumer Decision Making and Horticulture Skillathon Contests. Critical thinking is a vital life skill for 4-Hers, and SDSU Extension is dedicated to providing those opportunities for youth. In the CDM contest, youth are given a scenario and have to decide, for example, what laundry soap they should purchase based on the considerations of the class. They then rank those types of laundry soaps one through four. The CDM contest has classes in areas of personal finance, personal care, entertainment, nutrition and clothing. The Horticulture Skillathon tests knowledge of types of vegetables and fruits and basic plant care. The day was rounded out by weighing in 4-H market beef animals. The Artesian Vet Clinic graciously allowed the use of their facility. New for this year – all animals (breeding and market) need to be entered into www.4honline.com by June 1 by the 4-H families. If you are interested in joining 4-H, please contact the Sanborn Co. Extension office at 605-796-4380 or sanborn.county@sdstate.edu. …See another picture in this week’s issue of the Sanborn Weekly Journal. 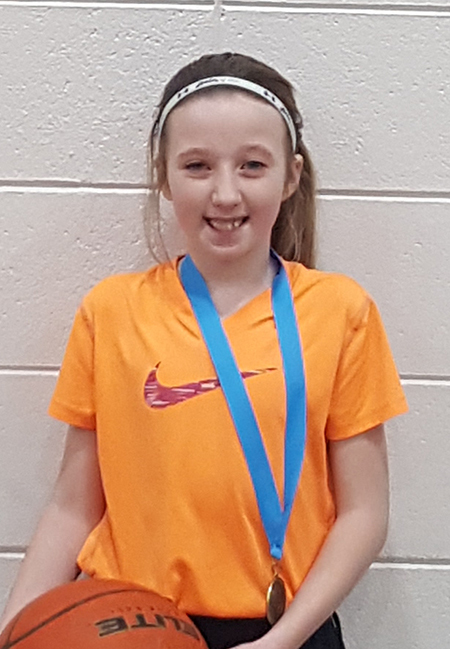 Addyson Baruth won the girls 10-year-old division of the District KC Free Throw Contest. She made 16 of 25 shots. 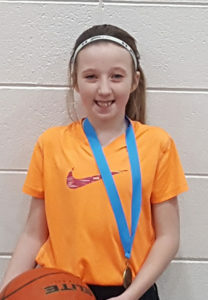 She has qualified for the state contest in Chamberlain on Sunday, March 4.